Katrina's Kreative Heart: Where Do You Find Your Inspiration? Where is it that you find your inspiration? I find my mine from so many sources. 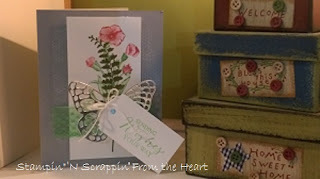 I look for inspiration on the internet, around the house, the office and my Stampin' Up! catalogs. And this new 2015-2016 is full of inspiration. Every time I open this catalog, I find something that gives me an idea to try, or I find something I want to copy and make myself. Today's card is a combination of copying and changing up the colors. It uses the Butterfly Basics bundle and some of the new in-colors. So, where do you find your inspiration?